Ok…….for the guys out there this post is going to be a bit gay but I blog about everything in Cambodia as you all know so screw you ;-). 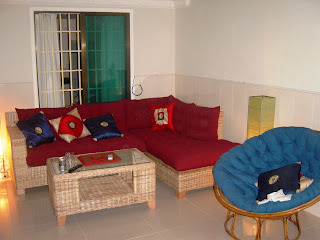 When Leakhana and I moved into The Compound, we spent about $3000 kitting it out with a bunch of furniture. My rationale for this was that as Cambodia is a fairly brutal place to live with heat and rain and few open spaces to relax that don’t involve spending money, I have always maintained your crib needs to be your castle. Plus I intend on being here for at least 5 years…hence the flat screen television ! Anyhoooooow…………. One of the items we bought was a really nice wicker L-shaped lounge. Problem was, they fill the cushions with the leaves or flowers from the kapok tree and after a while a) They lose all shape and heep sliding off the base and b) They seem to be filled with some kind of mites that nip at you – true !. So now that I am on the Professional Couch Potato Team of Cambodia, we made the decision to get some new base cushions made and the whole thing recovered. So for $547 we have a seriously comfortable sofa that would retail in IKEA back in Australia for $2000 ++. If we ever go back to Australia, it is coming with us ! The New ! Potato heaven.